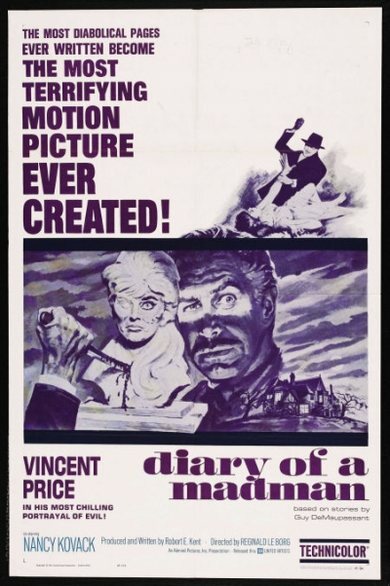 DIARY OF A MADMAN (1963): Propped Up By The Power Of Price – Schlockmania! As the early ’60s drew to end, plenty of producers were doing their best to cash in on Roger Corman’s successful Edgar Allan Poe adaptations. They quickly turned to stories by other vintage authors in hopes of finding similarly lucrative source material (even Corman did the same thing, turning to Lovecraft and Shakespeare). The smartest ones hired Corman’s iconic Poe star, Vincent Price, to carry their adaptations on his mighty shoulders. Even if the material was mediocre, Price always earned his paycheck with a powerful display of his horror icon chops. Diary Of A Madman is interesting example of Price plying his trade in a Poe cycle-inspired film. This effort draws its inspiration from the tales of Guy De Maupassant and is narrated from beyond the grave by Simon Cordier (Price), a French magistrate who recently died under mysterious circumstances. A post-funeral reading of his diary reveals his tragic tale, which involves him being possessed by a “horla” – a spirit of pure evil that can take over a man and drive him to terrible acts. Cordier tries to find salvation in art and the love of a gorgeous model (Nancy Kovack) but the horla won’t be denied its dose of mayhem. It’s an interesting premise, one that plays out kind of like Dr. Jekyll And Mr Hyde reinterpreted via parapsychological concepts, but it has a certain old-fashioned creakiness that keeps it from taking flight the way Corman’s gothic, European-influenced Poe films do. The script by producer Robert Kent has a kind of stop-start structure where horror and romance awkwardly offset each other and keep the film from building up a head of steam. Reginald LeBorg’s direction tends toward stodginess, as do most of the support performances. That said, Price is a delight to watch. He strengthens the material by living up to its many demands – tragedy, scares, romance – by displaying his ability to cover all those bases. He also establishes a nice rapport with Kovack, who is easily the best non-Price actor in the film. Diary Of A Madman doesn’t really get cooking until the final half-hour but Price keeps the audience engaged and delivers the required theatrics at the end, particularly during a Corman/Poe film-inspired finale. In short, Diary Of A Madman is a middling effort but the strong lead performance of Price makes it worth a look to his serious fans.